Taking Jamaica's dub-style instrumental music to places it's never been before, Britain's Dub Trio has created a musical meeting ground somewhere between Bob Marley and King Crimson. 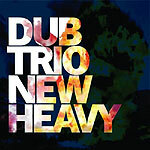 Switching between bass, guitar, drums and keyboards, the three members of Dub Trio create a swirling, intermingling groove that is influenced by but not really anchored in the reggae that originally gave us dub. Influences ranging from jazz (strong) to heavy metal (intermittent), alt rock to the blues abound, creating a sound that is true to dub by being heavy on the low end but one that is constantly swirling elsewhere. At times, the Jamaican roots of the music are indiscernible  much as the original blues and country that birthed rock 'n' roll have often disappeared from modern vintages of that style, as it has evolved on its own. But Dub Trio carries its debt to reggae on its sleeve, and it's never more than one track before those island grooves return. If this is the future of dub  a musical style all its own, moving into orbits far beyond the reggae where it was founded  it's an exciting development. Complex yet accessible, club-ready but also suitable for serious listening, it's wild, heady and very fun.